Each team shall consist of four loaders plus one driver. Responsible for ensuring that all teams abide by the rules of the competition and whose decision is final regarding any dispute that may be raised during the course of the competition. Responsible for signalling the start of the race and re-assembling the teams should the race have to be re-started. Responsible for checking the team nearest to them on the course is abiding by the rules of the competition and indicating to the penalty counter any penalty points that should be issued to the team by raising a flag. Responsible for taking the time that the team nearest to them takes to complete the race. Timing will start at the given signal and stop when both rear wheels of the vehicle have crossed the finish line into section 5 after the team has completed the race according to the rules of the competition. Responsible for noting any penalty points to be deducted from the team as indicated by the Lines Person and then passing this information along with the time taken by the Timekeeper to the score table. A penalty point will result in three seconds being added to the team’s finish time. The decision of the referee will be final on the issuing of penalty points. Where a rule is followed by P.P this indicates that a penalty point will be given for failure to abide by the rule. 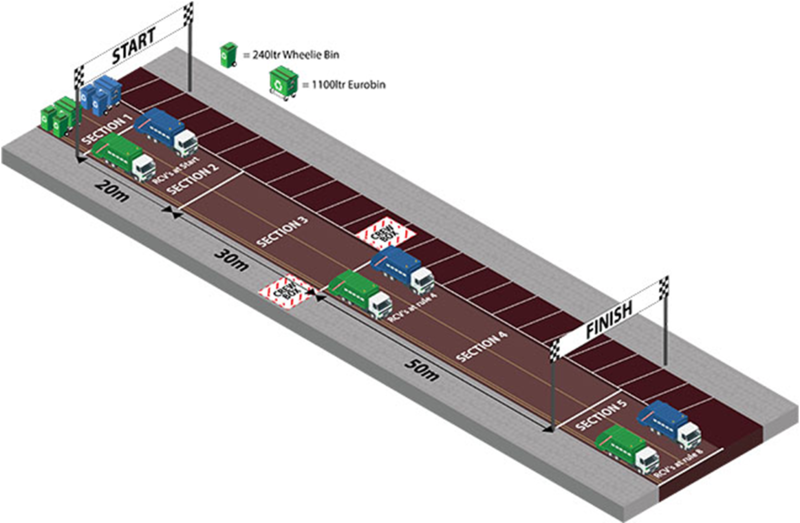 At the start of the race the vehicle shall be parked in section 2, with the teams including the driver waiting in the crew box in section 3. At the given signal the driver will run to, board and start the vehicle as quickly as possible. Timing for the race will start at the given signal. If a driver fails to start the vehicle both teams will return to the starting positions and the race re-started. Failure to start the vehicle a second time will result in non-starting team being eliminated. The other teams should continue the race against the clock for rounds one and two and the teams time included in the rounds over times. In knockout rounds the team will automatically move forward to next round unless the round is the final of the competition when the non-starting team will be given a third attempt. If on the third attempt the driver again fails to start the vehicle the other team will be the overall winner of the competition. The driver will then drive the vehicle through section 3 into section 4 and stop the vehicle apply the handbrake and leave the vehicle running. The driver must then leave the cab and run to the back of the vehicle and operate the lifting equipment to empty the bins into the rear hopper. The rear wheels of the vehicle must be completely over the line dividing sections 3 and 4 before the team can continue the race. The Lines Person will indicate to the driver if the rear wheels are not over the dividing line. The driver is not allowed to reverse the vehicle. Two loaders will then run back to section one to collect the two 240 litre wheelie bins and run back to section 4. The 240 litre bins must then be lifted and tipped into the rear hopper using the lifting equipment. The bins must then be returned to section 1 and the team members return to the crew box. Once the two members have returned to the crew box until the first two start to run back to section 1 to collect the 1100 litre bin. The 1100 litre bin must be wheeled to the vehicle and the lifting equipment used to tip the bin into the rear hopper and then returned to section 1. When all loaders are back in the crew box the driver can return to the cab and drive the vehicle into section 5 across the finish line. The finish time will be taken when the rear wheels of the vehicle cross the finish line. Each 240 litre wheelie bin will carry 10 kilograms of bagged sand and each 1100 litre bin will carry 20 kilograms of bagged sand. Penalty points will be issued by the umpires for any infringements of the rules and it must be added that good sportsmanship must be the order of the day. Members of the public will be in attendance including young children and displays of bad behaviour and language will be frowned upon.